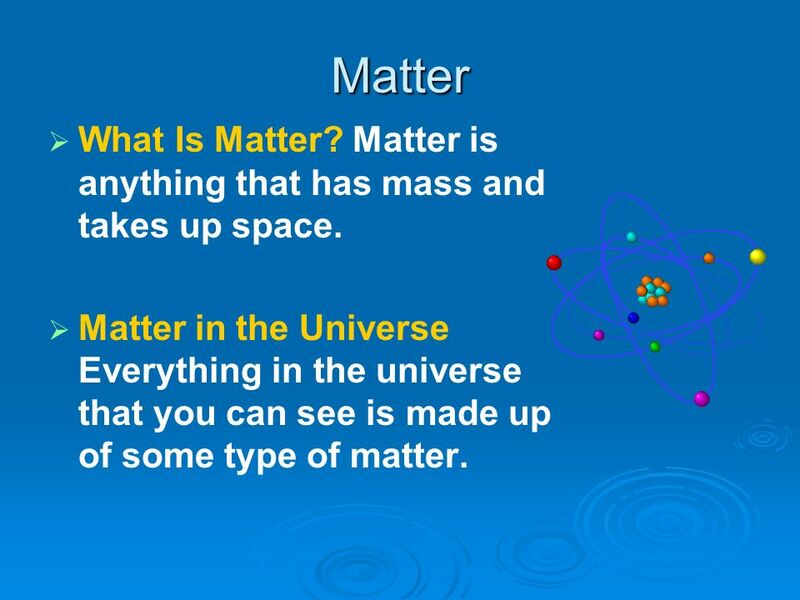 2 Matter What Is Matter? Matter is anything that has mass and takes up space. Matter in the Universe Everything in the universe that you can see is made up of some type of matter. 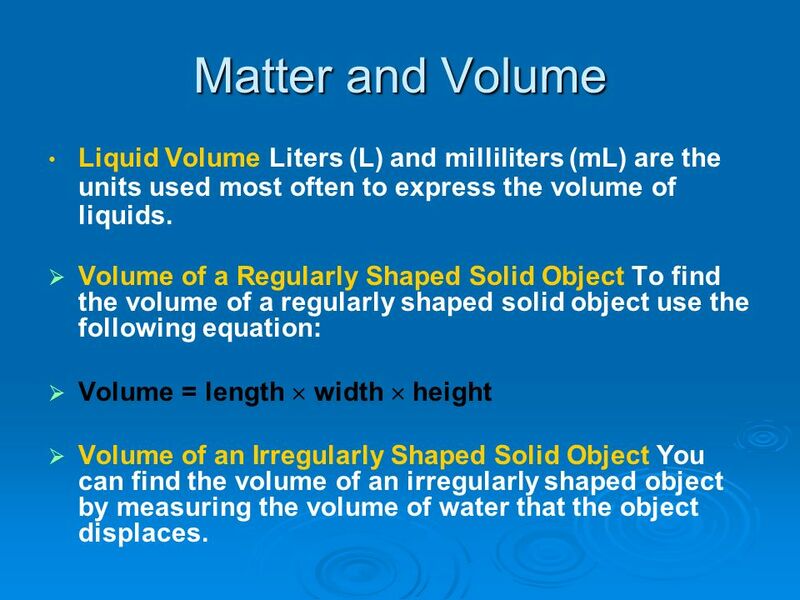 3 Matter and Volume Liquid Volume Liters (L) and milliliters (mL) are the units used most often to express the volume of liquids. 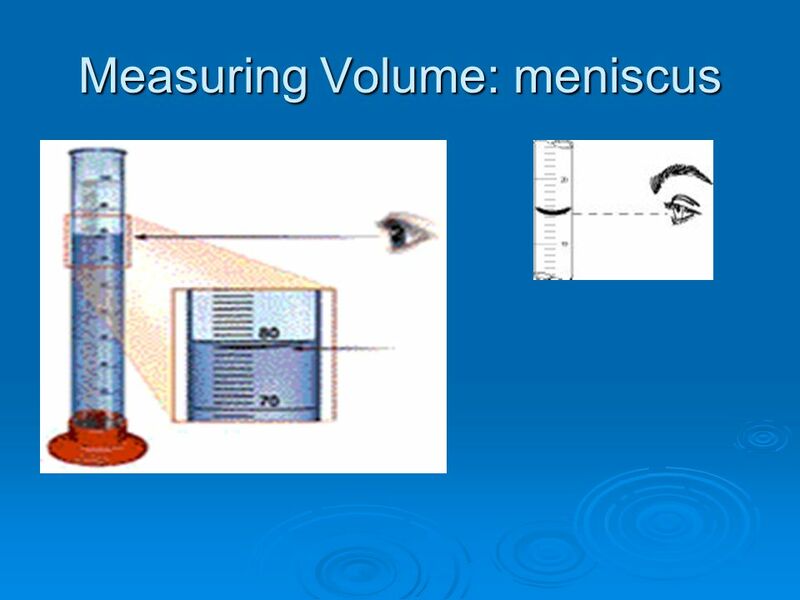 Volume of a Regularly Shaped Solid Object To find the volume of a regularly shaped solid object use the following equation: Volume = length  width  height Volume of an Irregularly Shaped Solid Object You can find the volume of an irregularly shaped object by measuring the volume of water that the object displaces. Weight is the measure of the gravitational force exerted on an object. The more mass an object has, the greater the gravitational force on the object and the greater the object’s weight. Measuring Mass and Weight The SI unit of mass is the kilogram (kg). 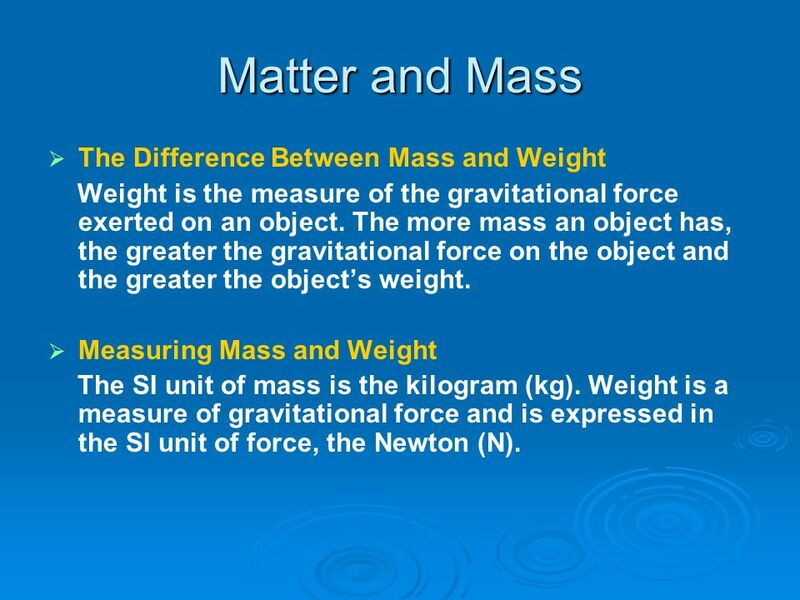 Weight is a measure of gravitational force and is expressed in the SI unit of force, the Newton (N). 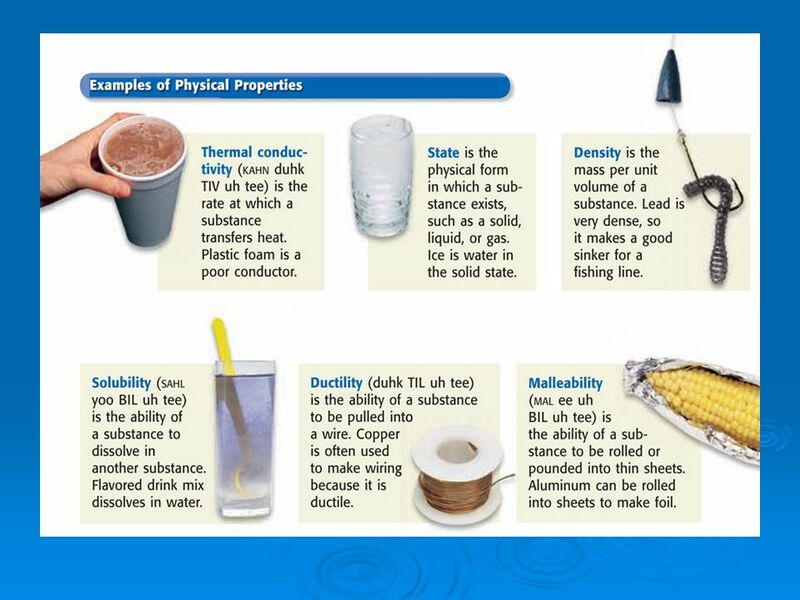 6 Physical Properties What Are Physical Properties? 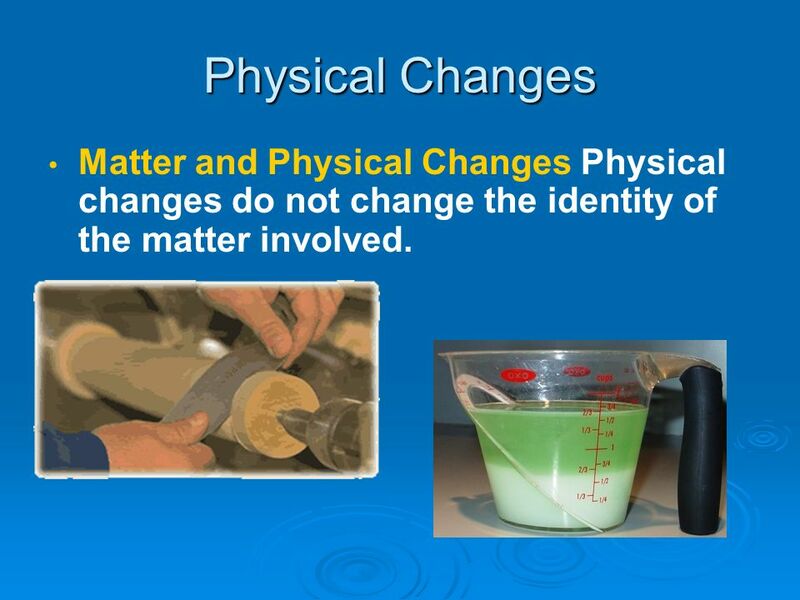 A physical property of matter can be observed or measured without changing the matter’s identity. 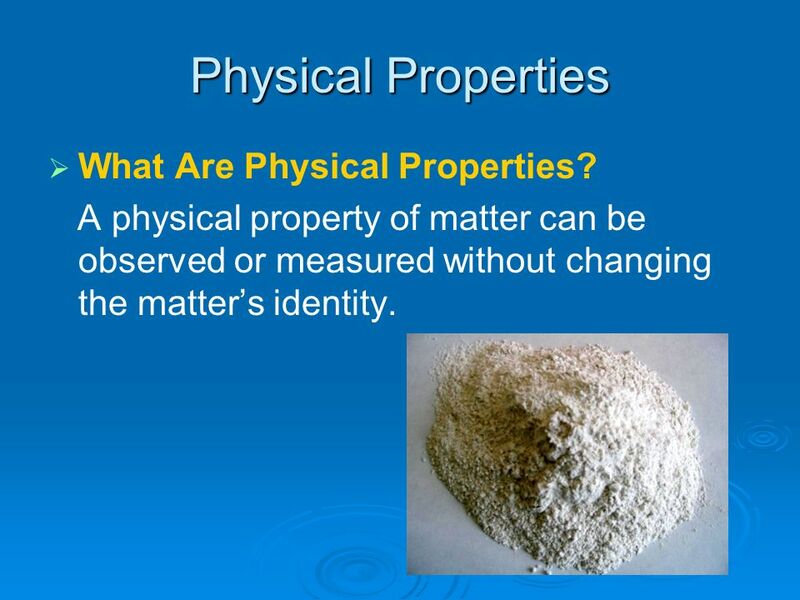 8 Physical Properties Identifying Matter You use physical properties to identify matter. 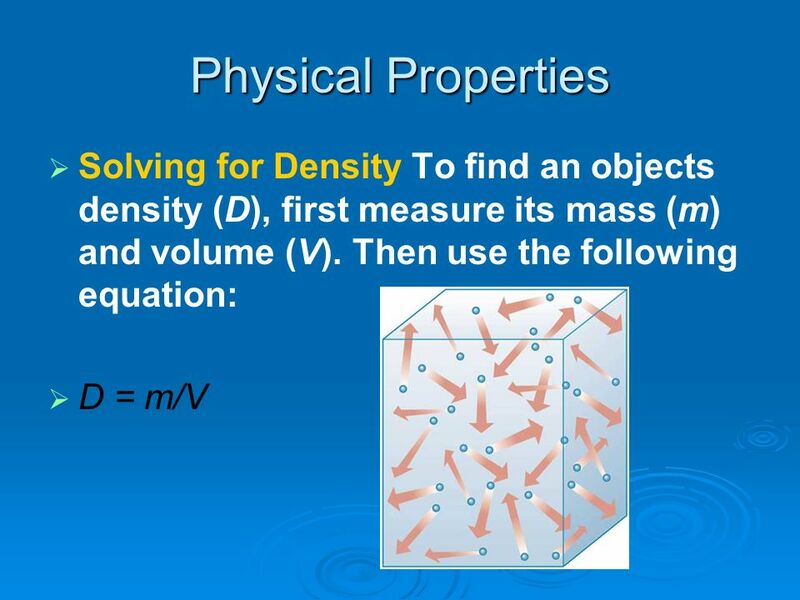 Density Density is the amount of matter in a given space, or volume. The two balls below have different densities. 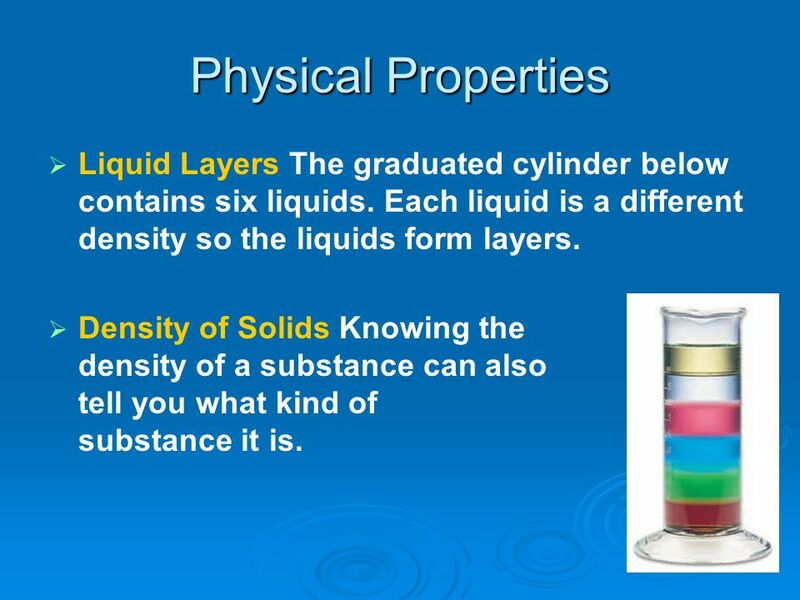 9 Physical Properties Liquid Layers The graduated cylinder below contains six liquids. Each liquid is a different density so the liquids form layers. Density of Solids Knowing the density of a substance can also tell you what kind of substance it is. 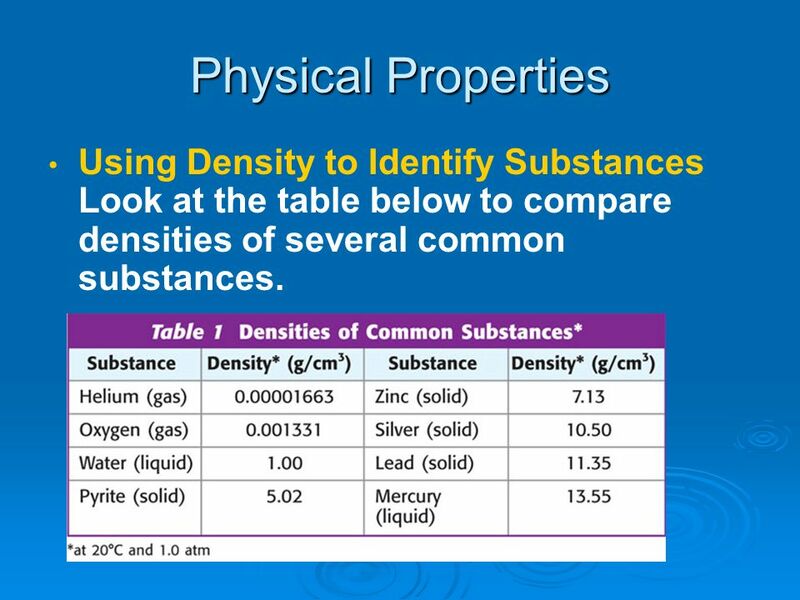 11 Physical Properties Using Density to Identify Substances Look at the table below to compare densities of several common substances. 13 Physical Changes Matter and Physical Changes Physical changes do not change the identity of the matter involved. 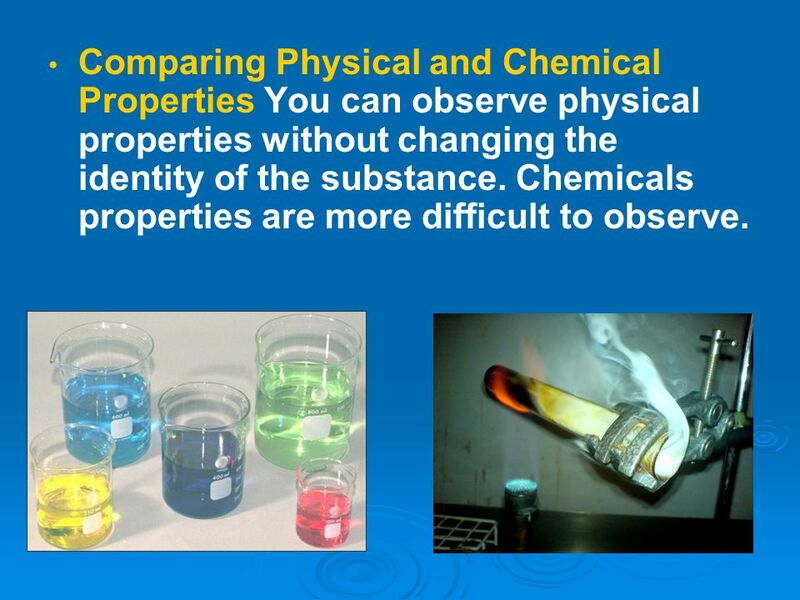 14 Comparing Physical and Chemical Properties You can observe physical properties without changing the identity of the substance. Chemicals properties are more difficult to observe. What Happens During a Chemical Change? 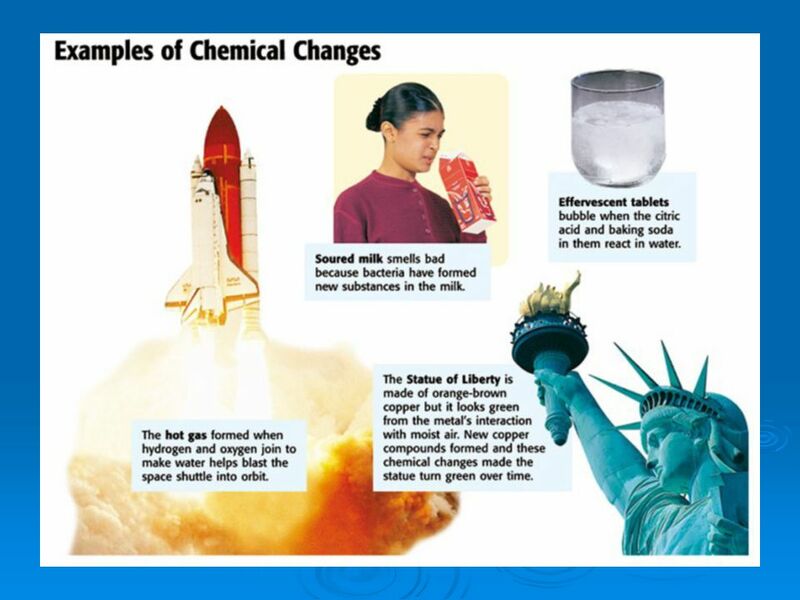 During a chemical change a substance changes chemical properties. 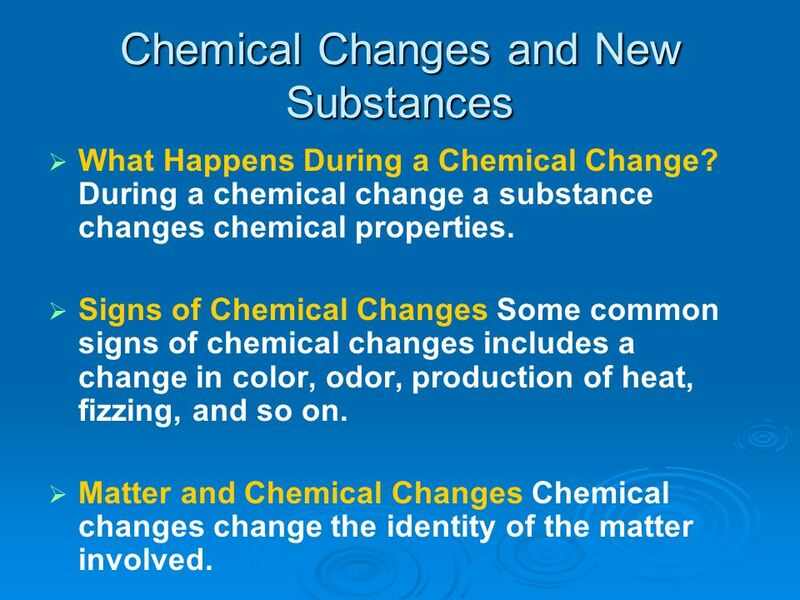 Signs of Chemical Changes Some common signs of chemical changes includes a change in color, odor, production of heat, fizzing, and so on. 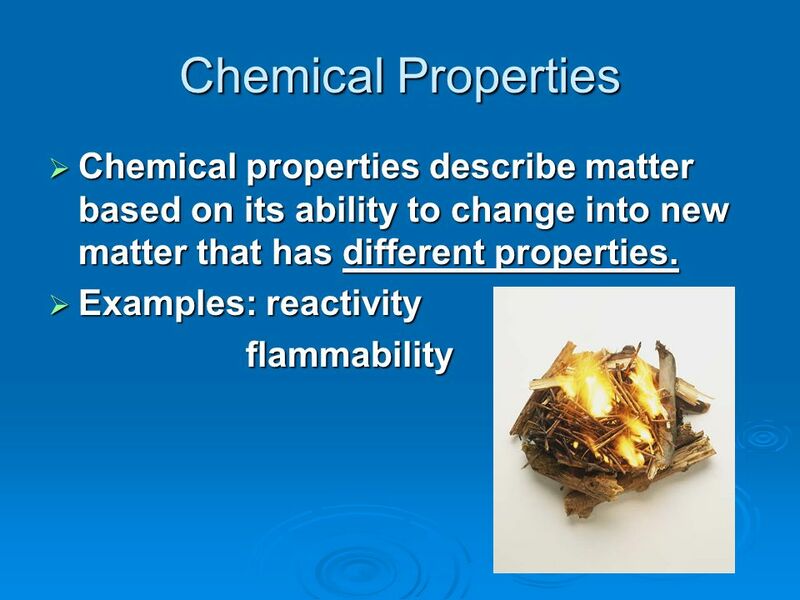 Matter and Chemical Changes Chemical changes change the identity of the matter involved. 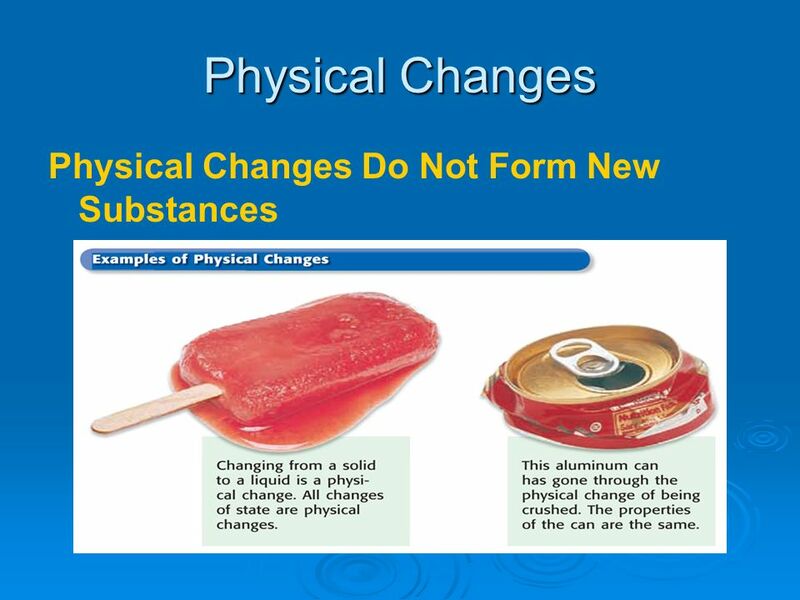 A Change in Composition Physical changes do not change the composition of a substance while chemical changes do. 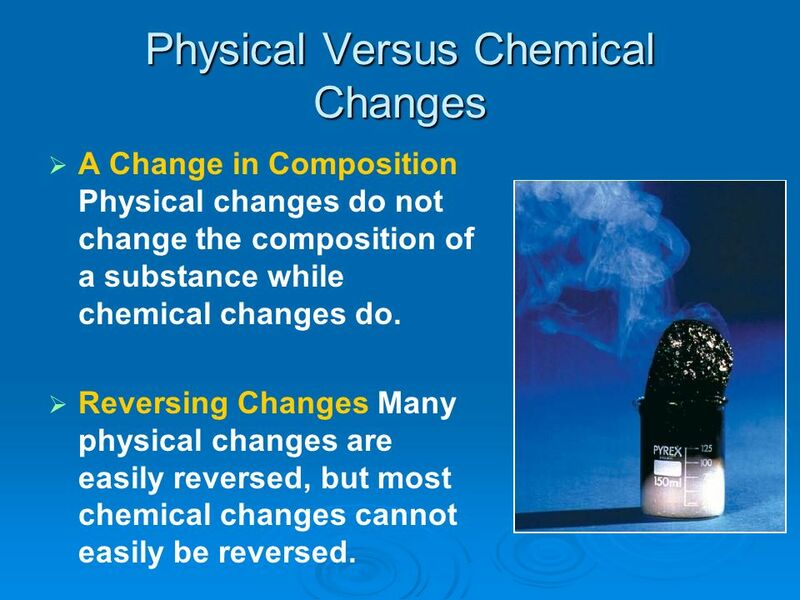 Reversing Changes Many physical changes are easily reversed, but most chemical changes cannot easily be reversed. 4. 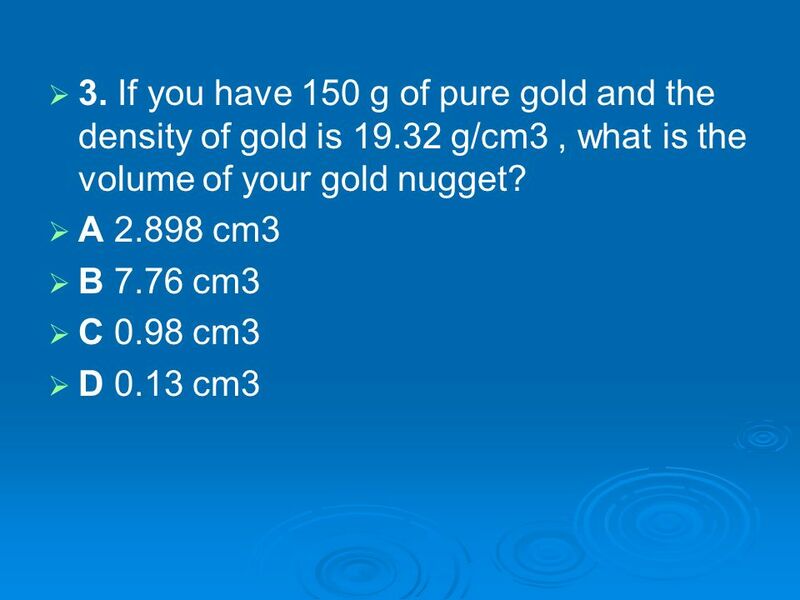 Three objects have a mass of 16 g each. But their volumes differ. 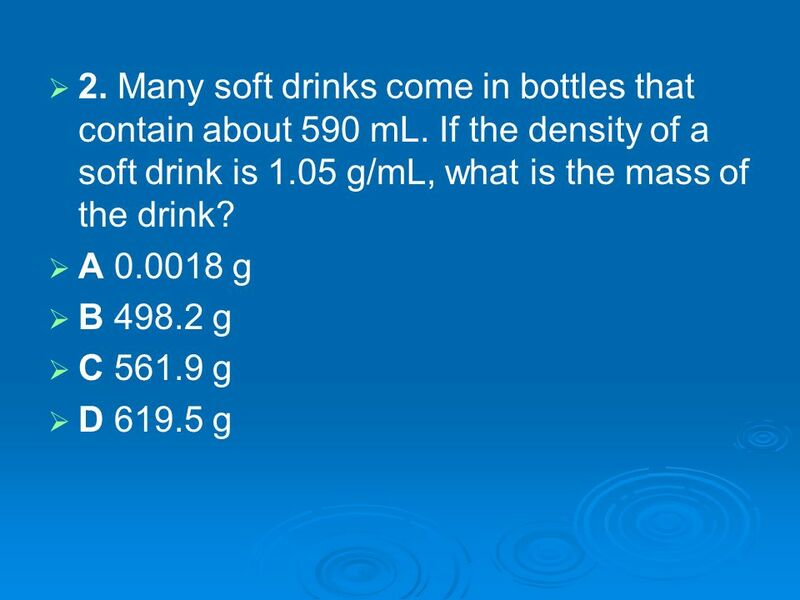 Object A, a liquid, has a volume of 1.2 mL. Object B, a solid, has a volume of 3.2 cm3. Object C, another solid, has a volume of 1.9 cm3. Which object is the least dense? 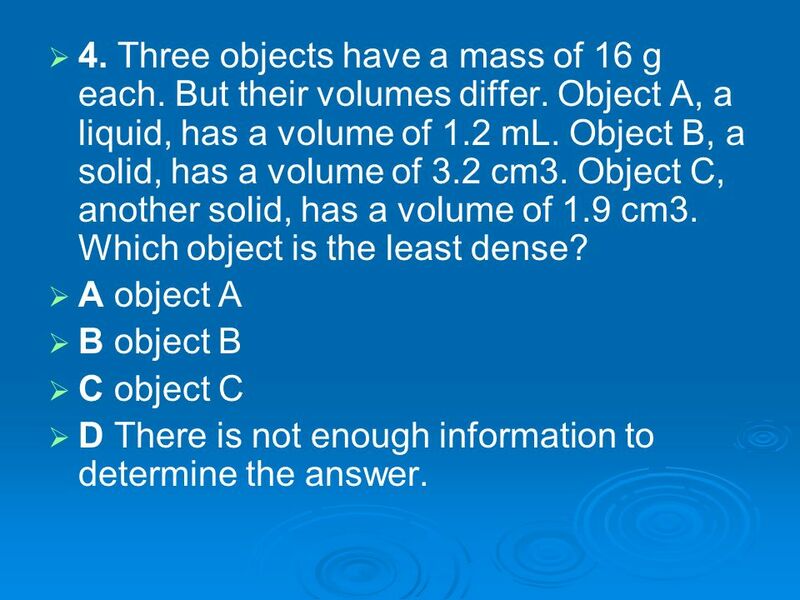 A object A B object B C object C D There is not enough information to determine the answer. 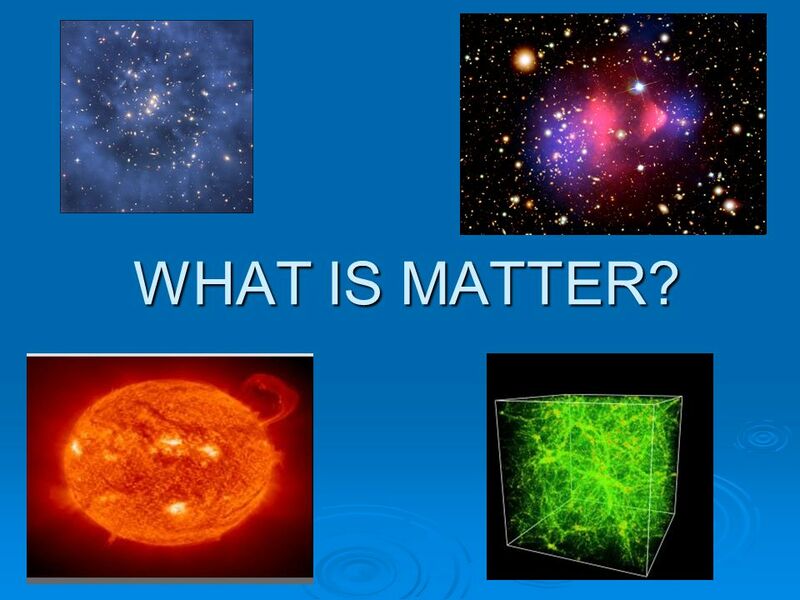 Download ppt "WHAT IS MATTER?." Which weighs more, a pound of feathers, or a pound of bricks? Measuring Matter 6 Beta Measuring Matter Which weighs more, a pound of feathers or a pound of sand? Which weighs more, a pound of feathers or a. Chemical Building Blocks Lesson 2 Chapter 1 Measuring Matter. Measuring Matter Chapter 2 Section 2. 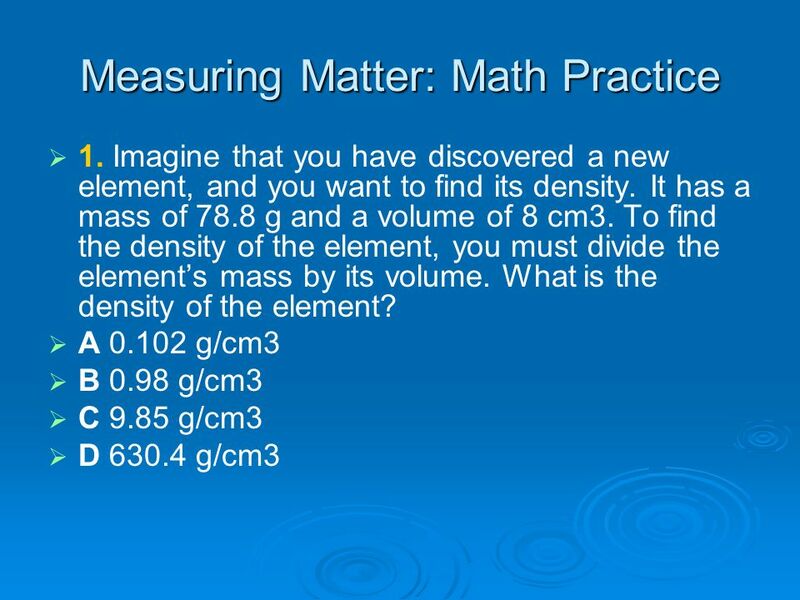 1 Anything that has mass and volume is matter 2 Which of the following is not matter? circle Electricitycarcloudlightningthe sunsunshine. Mr. Monson’s Science Class.  Matter is anything that has mass and takes up space. 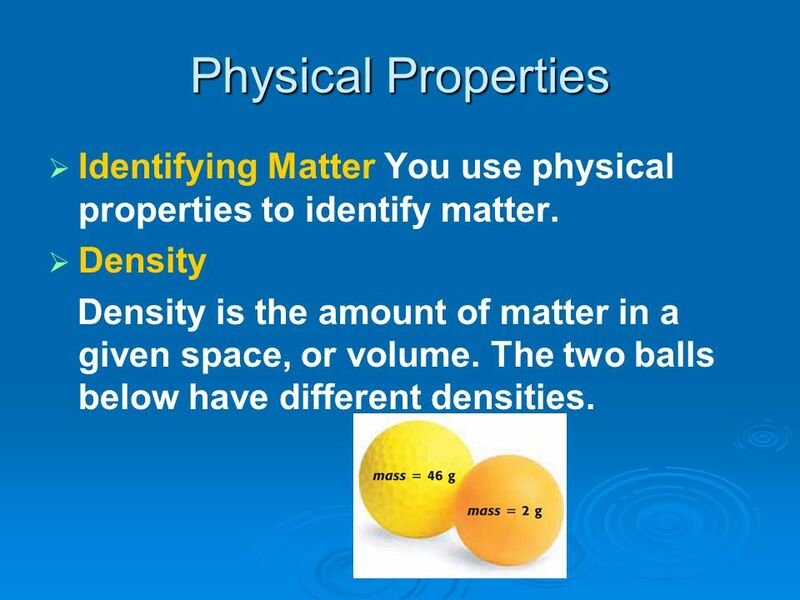 Physical versus Chemical Properties Unit II - Part 1 The study of matter.